Alexander Langlands, an archaeologist who has worked uncovering Britain’s history for decades, thinks much the same way, and in his book, Cræft, he explores some of the most basic skills in human history, skills that require us to touch the world with our hands, and that are intimately tied to our environments and ecosystems. Through historical context and personal experimentation, Langlands shows us how tasks that, today, we might deem very simple—tasks such as digging a trench, weaving cloth, making hay, and thatching a roof—actually require broad experiential knowledge to master. He uses cræft, the Old English of the word craft, to highlight the change in the word’s meaning over the centuries. Today, craft is applied to everything from bread and beer to bespoke suits and high-end automobiles, and “hand-crafted” is used to bump up the price of damned near anything. The word craft is rarely applied to vocations anymore, even though some occupations still require a great deal of hands-on experience to master. You’d hardly refer to a medical doctor as “crafty,” and yet any doctor will tell you that book-learning only gets you so far. You’ve got to do the work, to understand it fully. The same holds true for woodworking, farming, husbandry, pottery, and a host of other, pre-industrial skill sets, but the main difference with these is that book-learning won’t help you much at all. With these skills, these crafts, it’s all about experience. Competence only comes through the doing, and mastery comes only through doing while at the same time observing, understanding how the physical world reacts to what we’ve done. One part of history that rarely gets any ink is the lives of regular folk. History focuses predominantly on those in power, not on the day-to-day, and the artifacts of the lower classes are rarely found in archaeological investigation because, being made of poorer stuff such as wood and reed, they do not survive the effects of time. 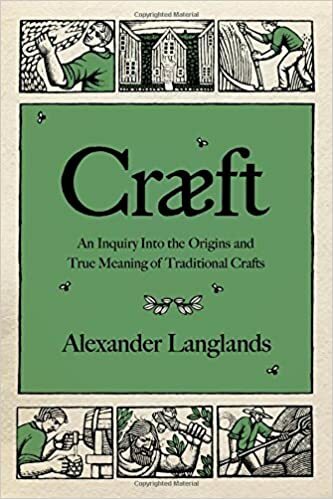 But Langlands’s focus on craft is all about the regular, day-to-day, and thus there is much written here that, despite the many books on history that have informed my past research, was new to me. Thatching a roof is a prime example. To be honest, everything I knew about thatching I learned from The Secret of Roan Inish and pictures of Anne Hathaway’s Cottage. To be fair, that’s not a lot to go on, so my assumptions that one always thatched a roof using reeds might be excused. With his chapter on the topic, Langlands broke those assumptions on the first page. How you thatch a roof and what material you use is entirely dependent on your environment, which makes sense when you think about it, and this was a revelation that played out in every chapter. The book would have been much more accessible (and Langlands’s often long-winded and detailed explanations more comprehensible) if illustrations had been provided. As with any centuries-old activity, there’s a wealth of jargon that comes with it. Langlands usually handles these well, giving us modern-day equivalents or descriptions of what he’s talking about, but sometimes he assumes we know things we probably don’t, and uses terms such as trug or spelk without enough context. An illustration of the tool, join, or component he’s describing would have gone a long way to helping lay-folk like me follow along. As both a field and an experimental archaeologist (he worked on three BBC series, recreating the techniques of medieval, Edwardian, and Victorian farms), Langlands’s prose sometimes gets a bit too “into the weeds,” and some of his anecdotes stray too far afield. There is so much to learn from this book, though, that I did not find these to be big issues. The study and information are so fascinating (especially if you are curious about the cultures and lives of people who lived ages ago), that despite the flaws, I enjoyed this journey through centuries past. And now, of course, I want to get a trug for use in my gardens. I, too find myself longing for the real, the tactile, in this virtual world. And yet, I just wrote a blog of gratitude for the digital remnants of my friendship with a pal that just passed away. They serve–in more “real” form–than any real convo I can conjure up in memory, of what we meant to each other. And yes, I see the irony in that . . . The real. The tactile. Oh very yes. It’s why I like real books, write real letters, cook from scratch, dig the garden dirt, prefer clocks that tick-tock, and write my novels with a fountain pen and paper. But the digital plays it’s part in my life too. I have done friends who now exist solely as Facebook pages, having passed away. Wishing them a happy birthday and sharing memories on their wall keeps their memory fresh. And in the balance lies the magic :-). Great review and analysis of editing problems! Perhaps you could write to the author and offer to edit his second edition — include more photos and cut the technical jabber!